Another interesting and very affordable option are beer pump chillers. Like dual coil spirals found here. Copper is an essential trace element for most living things, including yeast (and drinkers). And I'm sure my yeast nutrient contains copper. But, at typical wort pHs, which can be corrosive to copper, I'd be concerned they get more than actually required. That can be dangerous, in a chronic sense. Sorry, SS is not just easier to clean. It's more stable and less toxic. There's an interesting experiment: which yeast (and drinkers) remain viable longer; those in worts exposed to copper or SS? Scary, this science stuff. McMullan wrote: Copper is an essential trace element for most living things, including yeast (and drinkers). And I'm sure my yeast nutrient contains copper. But, at typical wort pHs, which can be corrosive to copper, I'd be concerned they get more than actually required. That can be dangerous, in a chronic sense. Sorry, SS is not just easier to clean. It's more stable and less toxic. There's an interesting experiment: which yeast (and drinkers) remain viable longer; those in worts exposed to copper or SS? Scary, this science stuff. PS! "Science stuff" is not scary. Stupid rumours and guesses, presented as facts, are. And, as a biologist, I do wonder about chronic (long-term) exposure risks. Copper, above trace levels, in the blood can promote the formation of chemically reactive molecules that damage DNA. I don't mean to sound alarmist. Wort chillers are not the only source of 'free copper'. Of course copper is 'safe'. But I considered it and decided, in the long run, it wasn't for me. Why can't you make SS chillers too? Sure I can. No problem at all. I am deciding which immersion chiller to buy with my BM20. The original Speidel ones look like it has much less tubing compared to alternative stainless steel wort chiller. Meaning it has much less cooling surface compared to the other one. Can some confirm that the picture on Speidel site is correct one? SS is tougher to bend. Copper bends much easier. maxx wrote: I am deciding which immersion chiller to buy with my BM20. 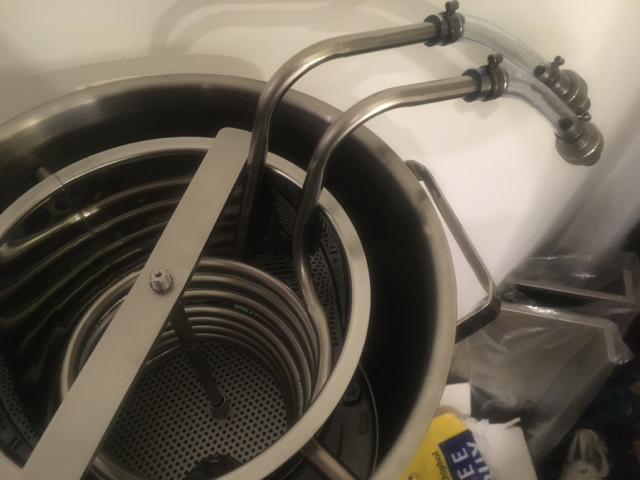 The original Speidel ones look like it has much less tubing compared to alternative stainless steel wort chiller. Meaning it has much less cooling surface compared to the other one. Can some confirm that the picture on Speidel site is correct one? This is a surface area thing. Go for the one with the most coils. Mine is a double coil (coil within a coil) , and even that is not as efficient as 4 ice packs. Indeed, that is my plan to get the one with most cooling area, but I would like some confirmation that Speidel chiller is really loking like the one on the picture. If you go to Speidel store site all three (10L, 20L, 50L) chillers have the same picture, thus I am not sure how does 20L version looks like. My Speidel chiller for the 20L doesn't look like your first picture but more like the second one. Thank you Aleman. Would you mind taking a picture of your wort chiller. Of course when you will have time. i've got both a stainless and copper wort chiller, the copper one i had for a previous boiling bucket i used to use pre BM and the stainless for my BM - irrespective of the safe / unsafe arguments i'm for stainless purely from the cleaning down perspective, the copper always seemed to tarnish and the trub in the boiler would stick to it, this mean't a good scrub after use and ordinarily i'd clean it again before re use, the stainless on the other hand comes out pretty clean and just takes a squirt of the hose to wash the wort of. I've personally not really noticed any real difference in time to chill, i use the time it takes to clean down other stuff and get things sorted anyway, so its not wasted or dead time for me. I use the speidel chiller few times. With my setup the temperature is down in less than 15min. The clip holding the outlet pipe to the chilled shot of under full water pressure and jet of water sprayed the entire brewery.